The Willamette Valley wine region, once known for its fruit orchards and nurseries, has become one of the United States' premier producers of cool-climate varietals like pinot noir. Start your wine country tour with hotel pickup from downtown Portland, and make your way by Mercedes Sprinter Van to three wineries carefully chosen by your in-the-know guide. Portland is the perfect hub for exploring quiet backcountry roads through Oregon’s wine country, with more than half of the state’s 500 or so wineries located about 45 minutes away in the nearby Willamette Valley. As you drive past towns such as Newberg, Forest Grove, Sherwood and Gaston, take in beautiful vistas of gently rolling hills that give way to the expansive valley dotted by the Cascade Mountains. With your guide, visit three of the area’s top wineries, where you'll learn about the unique relationship between the valley's volcanic soils, elevation and protective microclimates — ideal for producing pinot noir. At each winery, taste a select group of varietals that will please even the most discerning palate, from reds like syrah, cabernet Franc and cabernet sauvignon to award-winning chardonnay, barbera and riesling. 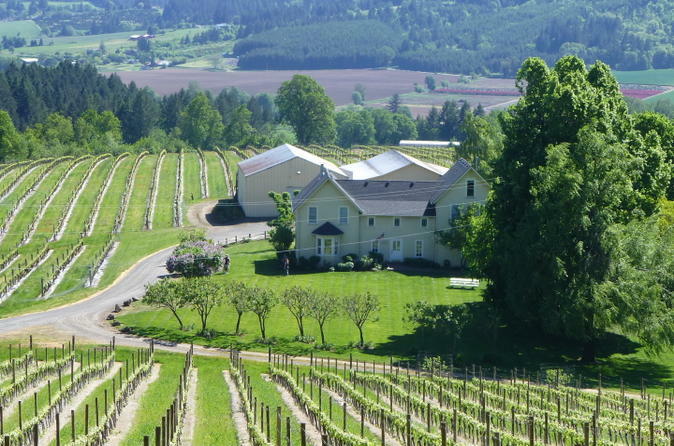 After your wine-tasting experience, your tour ends with return to Portland for hotel drop-off.